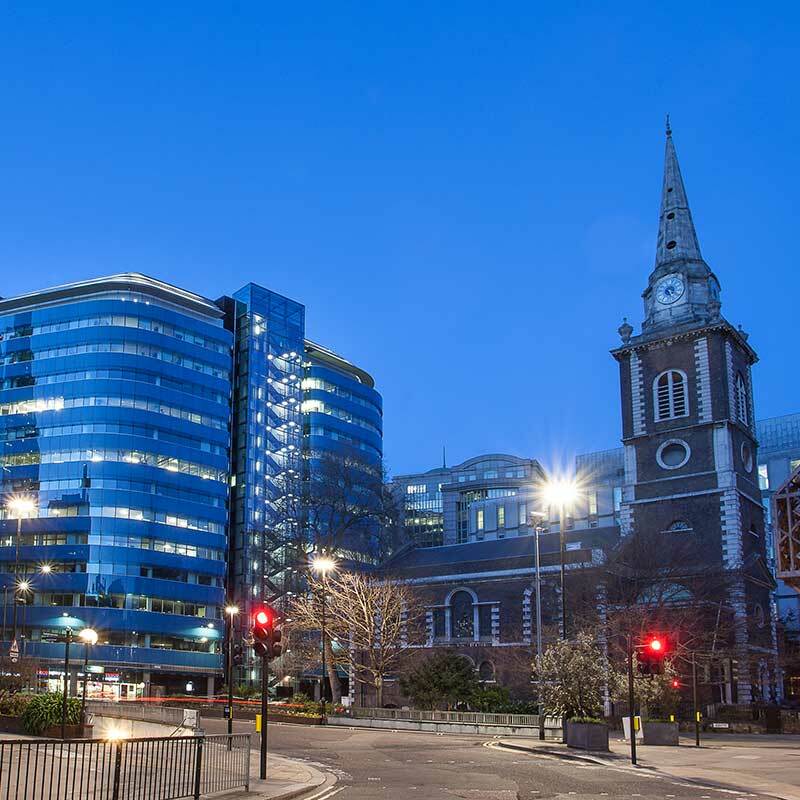 The St Botolph Building provides over 500,000 sq ft (46,450 sq m) of highly specified and flexible offices designed to meet the requirements of City occupiers. The building is a striking, state of the art office building which is designed both architecturally and operationally for the modern occupier. The landmark scheme, designed by leading international architects Grimshaw, is of significant architectural merit with glass cladding, an impressive reception and a generous stepped atrium. The St Botolph Building is the first major office building in the UK to use TWIN® lift technology, with 16 lifts operating independently in eight shafts within the central atrium. Houndsditch is a street in the City of London that connects Bishopsgate in the north west to Aldgate in the south east. The modern street runs through a part of the Portsoken Ward * and Bishopsgate Ward Without. The street marks the route of the old City of London Wall, as far as the “Old Gate”. The name ‘Houndsditche’ first appears in the 13th century, and was first paved in 1503. * Portsoken is a historical district in the City of London, located outside the former London Wall, on the eastern part of the City, near Aldgate. It is one of the 25 wards of the City. Aldgate and Tower wards lie to the west, and its eastern boundary is defined by Middlesex Street, in Whitechapel. To the north, the boundary meets Bishopsgate and Spitalfields; to the south, the former liberties of the Royal Mint. The St Botolph Building is ideally located in the prestigious EC3 insurance district, a short walk from the Lloyd’s Building. 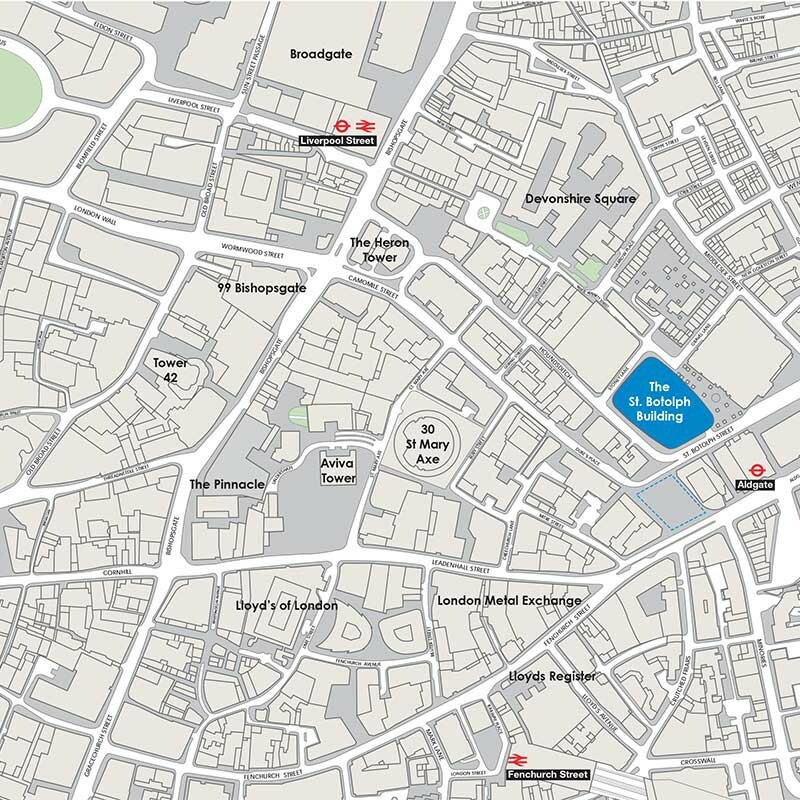 Broadgate and the Liverpool Street transport interchange are 400m to the north west; Bank and Fenchurch Street stations are within easy walking distance. The area also enjoys a rich cultural diversity, with Leadenhall Market, Spitalfields and Brick Lane a few minutes away. Nowhere else in the City of London offers this range of amenities for occupiers. All pertinant travel information can be found on the TfL website. Click here to plan your journey. Alternatively, click here for live status updates direct from the TfL website. 138 Houndsditch, London, EC3A 7DH. Click here to find the building location.